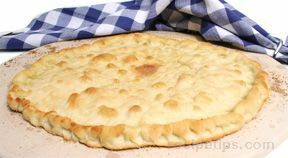 Challenge yourself and try an adventure in making pizza dough that will trump any pizza restaurant! This recipe has been specially written for grilled pizza. Whisk ingredients together in large mixing bowl and let sit for 15 minutes. Mix with clean hands and form into a ball. Knead by pressing ball flat, folding and pressing again. As you knead, you stretch the gluten, the more you knead, the more elastic and delicious the crust. Minimum kneading time, 5 minutes. Cover with plastic wrap, then with dish towel. Punch down, and form 4 balls. One rise is enough for pizza dough. Two rising times is optional. On lightly floured work area, take each ball of dough and pat down with clean hands. Work pressing and turning until you get a 5" wide shape. A light dusting of corn meal in addition to the flour enhances handling and flavor. Take a floured rolling pin and gently roll from the center in all directions, turn. Do not press hard. Rolling out your crust takes several turns of the dough. The more irregular, the more authentic, don't worry about keeping a perfect circular shape! Pre-heat GrillGrates (5-8 minutes). Lid down. For charcoal, preheat GrillGrates after the red hot peak, gray coals only (5-8 minutes). Lid Down. Place rolled crusts carefully on preheated GrillGrates. You only need to grill each side for 3 minutes with the lid down. 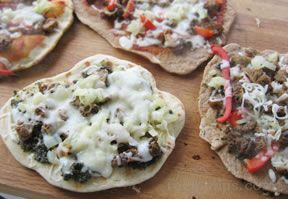 Don't fully cook, as you will want to have a crust that will take another grilling with your pizza toppings. You can reserve these crusts for pizza making later the same day, or tightly wrap and freeze for future use.